This past February, I created Dietitians for Professional Integrity, a group co-founded with 15 other registered dietitians that advocates for ethical and socially responsible sponsorships within the Academy of Nutrition and Dietetics. This came on the heels of the release of public health lawyer Michele Simon’s thorough report “And Now A Word From Our Sponsors,” which took an in-depth look at the Academy’s Big Food ties, making national headlines. For years, many of my colleagues and I have voiced our discontent that the professional organization that represents us takes money from and partners with the likes of Coca-Cola, PepsiCo, McDonald’s, and Hershey’s, supposedly to foster dialogue with the industry and help Americans get healthier. In reality, Big Food gets free press for feigning concern, while going about its usual business, and the registered dietitian credential gets dragged through the mud. “Too often I’ve lost the trust of potential clients because, despite my rigorous education in nutrition, they only see the dietetics field as corrupted by big businesses,” says Matt Ruscigno, MPH, RD, one of Dietitians for Professional Integrity’s co-founders. 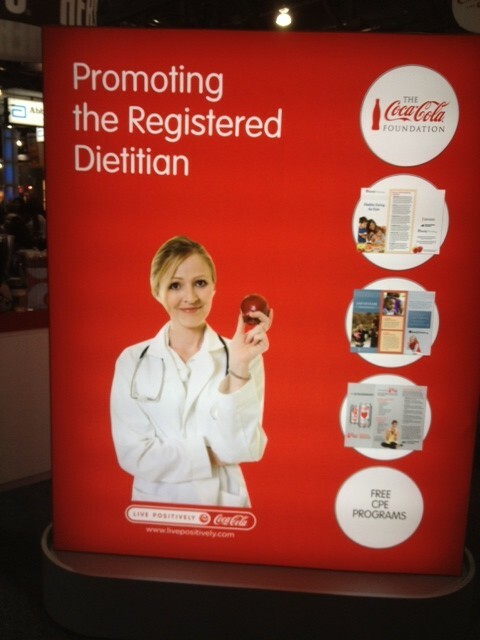 Over the past four months, Dietitians for Professional Integrity has shared many statements of concern from registered dietitians on its Facebook page, and helped raise awareness of Big Food’s influence on the Academy (from the world’s largest aspartame producer helping to fund the organization’s evidence analysis team on the artificial sweetener to Coca-Cola’s Academy-approved continuing education webinars which teach dietitians that soda is unfairly vilified). This influence eventually trickles down to consumers, as the Academy staunchly defends the message that “all foods fit equally,” rather than dispensing science-based advice that would better inform the public as to how and why certain foods (coincidentally, mainly the ones produced by their partners) are more harmful than others. McDonald’s egg white McMuffins, for example–presented at the Utah State Dietetic Association meeting by McDonald’s Director of Nutrition as an example of the chain’s “healthful offerings”–are cooked in partially hydrogenated oils, the most heart-damaging types of fats. Academy partner Kellogg’s, meanwhile, recently launched Froot Loops Treasures cereal, which packs in a tablespoon of sugar per 1-cup serving, and is made with trans fats and four artificial dyes. In an effort to show how misinformed that perception is, Dietitians for Professional Integrity posted a petition on Change.org on June 17, which formally asks the Academy’s leadership to sever the organization’s ties to Big Food. In its first week, the petition received over 15,000 signatures from dietitians, other health professionals, and concerned citizens who are simply tired of Big Food co-opting science and interfering with public health messaging. The petition has received the support of food thought leaders like Marion Nestle (who wrote about these sponsorship issues in her seminal 2002 tome, Food Politics) and Mark Bittman, ultrarunner Rich Roll, and The Unhealthy Truth author Robyn O’Brien. The petition’s concerns go beyond the products these companies market and also touches on corporate behavior. Many of the Academy’s sponsors and partners have been called out by Oxfam and other leading non-profits for questionable behavior. “Nutrition goes beyond calories, grams of fat, or teaspoons of sugar. It’s also about the ingredients used and the environmental impacts of the production process,” explains Dietitians for Professional Integrity co-founder Elizabeth Lee, MS, RD. While the Academy has not publicly commented on the petition, they have engaged in some eyebrow-raising tactics. Dietitians for Professional Integrity, currently putting finishing touches to its upcoming Web site, was surprised to find out that just six weeks ago, the Academy bought the IntegrityRDs.com domain (IntegrityRDs is the group’s Twitter handle). Let’s hope that when the petition is officially submitted to the Academy this October at its annual conference, Academy leaders step up to the plate and dialogue; it’s the least they can do for an American public that has one very simple ask: Prioritize public health, not the food industry’s seductively deep pockets. We read about this earlier and signed the petition! What a terrible way to promote healthy living. I understand what these companies are aiming to do, add more nutritional credibility to their brands. However, there's simply going to be a dissonance between what these companies do and say until visible, healthy changes are made in their product lineups- or they drop these kinds of promotions altogether. One or the other needs to happen, and it needs to happen now.